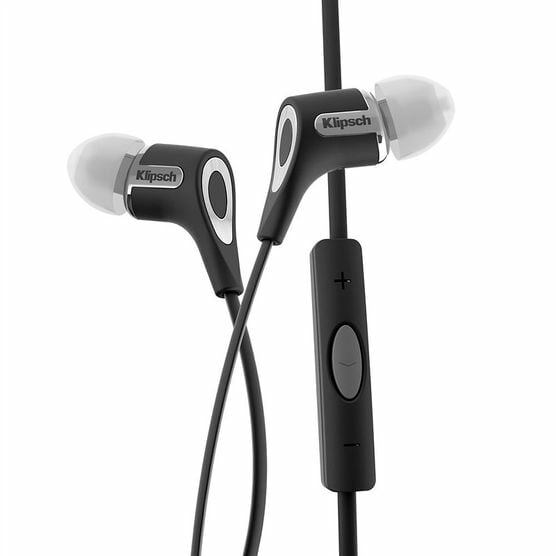 The Klipsch R6iB In-ear Earphones with Mic and Apple Control – Black are designed to be the best sounding, most comfortable headphones, and the true embodiment of the legendary Klipsch sound. The Klipsch R6iB in-ear headphones use dual magnet, moving coil drivers to cover a wide frequency range with crisp detail and strikingly realistic sound. They also feature a flat, tangle-resistant cable for hassle-free storage and transport in their included carrying case. Along with the tangle-free cable, the Klipsch R6iB in-ear headphones come with four different sized sets of ear tips so you can fully customize them to perfectly fit your ears. They also allow you to take full control of your phone calls and music through your iPhone or Android. The Klipsch R6iB in-ear headphones use the same advanced acoustic engineering and industrial design from their legendary Reference home theater speakers. The R6iB headphones are constructed from aluminum and elastomer, with a sleek design that remains lightweight and comfortable as well as extremely durable. The Klipsch R6iB in-ear headphones are the only choice for someone looking for reference quality audio without the bulk of over-ear headphones. The same advanced acoustic engineering and industrial design from our legendary Reference home theater speakers provide the performance, voice and design for the Klipsch Reference R6i monitors. Klipsch Canada 2 Year Warranty.